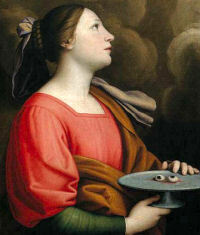 According to tradition, St. Lucia’s were gouged out and so she is depicted holding them. Her eyes saw the fair beauty of the Lord for herself and others. O Almighty God, by whose grace and power Your holy servant Lucia triumphed over suffering and remain ever faithful unto death, grant us, who now remember her with thanksgiving, to be so true in our witness to You in this world that we may receive with her new eyes without tears and the crown of light and life; through Jesus Christ, our Lord, who lives and reigns with You and the Holy Spirit, one God, now and forever. Amen.